David and Nicole are hosting and you’re invited! 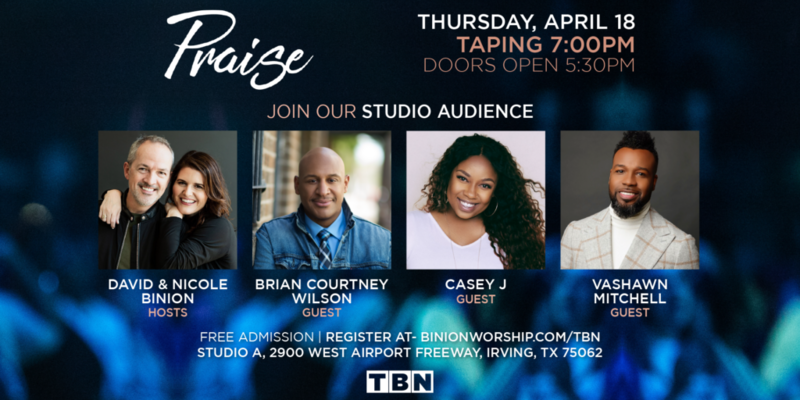 We’re honored to be hosting a live recording at TBN again this month with three amazing artists: Brian Courtney Wilson, Casey J, and Vashawn Mitchell. We have no doubt that this is going to be a great evening and we want YOU to be in the studio audience. Brian is a Dove Award-winning gospel artist whose inspirational and community minded music is known in churches and Christian circles across the country. Throughout his career Brian has performed at TD Jakes Megafest, BET Celebration of Gospel, and the 47th Annual Dove Awards. In 2015 Brian’s song, “Worth Fighting For,” reached Number 1 on the Billboard Gospel Songs and Mediabase Gospel Chart and was also nominated for a Grammy later that year in the Best Gospel Song category. His full-length album titled Fighting For won him the Dove Award for the Traditional Gospel Album of the Year. Casey J’s freshman album The Truth debuted in 2015 and propelled her to win the Stellar Award for New Artist of the Year in 2016. Her best known songs “Fill Me Up” and “I Am Yours” resonate with worshipers of all backgrounds. While known as a Christian radio artist, Casey J keeps corporate worship as a core theme of her songs. Her newest project titled The Gathering was recorded as a live-worship experience in an outdoor venue, and is available on all streaming sites. Longtime singer/songwriter VaShawn Mitchell has released 7 albums over the course of his career as a gospel artist. In 2010 his album Triumphant was nominated for a grammy and contained a single titled “Nobody Greater” became the most played gospel track of 2011. At the midpoint of his career, VaShawn’s LP Created 4 This crossed over into the R&B charts, opening a new audience to his music. His most recent album Secret Place was recorded live in South Africa in late 2016. This is your invitation to be a part of the live audience at TBN. We are expecting a full house so we need you to click the link below to RSVP so we can provide you all of the important details as we get close to the event and to make sure your seat is secured. Although seating is limited we are not restricting the number of people you may register. However, we must ask that you provide full name and valid contact email for every person if registering a group of two or more. This will enable us to ensure that correct information and instructions can be delivered to all attendees as needed.